As I'm sure all parents do, every now and again I go back and look at photos of my kids when they were younger. It's astounding how quickly time goes by... day by day, year by year, they grow and evolve into their own person. They develop their own sense of humor, quirky and unique personalities... Sometimes you can see yourself in them so clearly, and sometimes you wonder "where in the heck did THAT come from?" So many photos tell a story... all you have to do is look at a photo of a child and an immediate scenario comes to mind. Chocolate covered smiles, tears of utter devastation, twirling and dancing around like only a child can. Then sometimes, there's a photo that makes you think "what on earth....? How in the heck?...." This is one of those photos. This is a photo of my son when he was about three years old. I never cease to marvel at it in amazement... not only that it actually happened, but that I was able to capture it in a photo. We were playing in the back yard. He was obsessed with the storage building that houses all of the lawn equipment, fertilizer, yard tools, etc. He kept trying to open it to go inside. I continued to tell him "no" and to "stay away" from the storage building, to no avail. 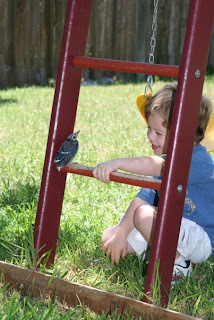 I saw a bird, a young Blue Jay, on the ladder of our swing set. I said "Milam, look there's a bird!" He said "where?" I said "On the swing set." He still didn't see it, so I pointed and told him it was on the ladder. He said "can I pet it?" I said "sure!"... thinking, of course, that the bird would fly away. He walked toward the Blue Jay. As he got closer and closer, I kept waiting for the bird to fly away. He continued, even closer, and the bird remained perched on the ladder. 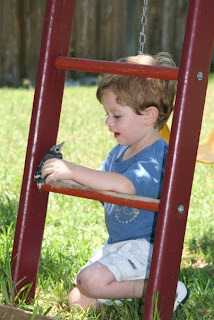 He was now right next to the perfectly still bird... it remained on the ladder, unimpressed by how close my son now was. Milam reached his hand out to touch the bird... I thought surely this was the moment the bird would fly away. To my shock, and amazement, it didn't. Milam began petting the bird and the bird remained still, allowing him to gently touch him and stroke his back. In awe of the moment, I rushed inside to get my camera.... Fairly certain the bird would have flown away by the time I got back, I still had to try to capture this moment. I returned with my camera and there sat Milam, still gently stroking the bird. I got more than one photo of this absolutely precious moment, but my favorite is of his hand actually touching the bird and the look of innocence and joy on his face. If ever I need lifting up from a particularly stressful day, these pictures do it for me every time. And each time I look at my son, petting the Blue Jay, my heart is full. That is amazing! Love this! I love it too, Katy... It always fills my heart and makes me smile. I love the way he is smiling at it. Mine, also, Elaine. He's fortunate both to have a Mom that encourages him to dream, and a loving heart that even wild birds can recognize.